The final stages of a teardown on Valentine Street in West Newton Hill. A group of residents is pushing to create a local historic district to combat teardowns in the West Newton Hill neighborhood, but critics say the move would impose unfair restrictions on property owners. Establishing a local historic district would provide a powerful tool for blocking home buyers and developers from purchasing a house with the intent to knock it down. The measure would create a local commission that would have authority to block demolitions and limit exterior changes to buildings. “We’ve seen perfectly good houses go into dumpsters,” said Laura Foote, who has supported the effort in West Newton Hill, an area known for its distinctive Queen Anne, Colonial Revival, and Shingle-style homes. Establishing a local historic district would give residents “a chance to pause and figure out what gives our neighborhood its architectural character,” Foote said. But Betsy Hecker, whose home has been remodeled several times since it was built in the 19th century, said the city’s existing rules keep residents safe and make Newton a good place to live. “I don’t believe we’re entitled to make aesthetic decisions for neighbors, nor should they be entitled to make them for us,” Hecker said. Newton already has historic districts in Upper Hills, Chestnut Hill, Newtonville, and Auburndale. City officials are also considering a separate proposal for a historic district in Newton Highlands, which had a public hearing last month. Both proposals would need approval from the City Council. The push for more local historic districts comes as teardowns and new construction increasingly change the face of residential neighborhoods in Greater Boston and beyond. About 250 historic districts are spread out among more than 120 cities and towns across Massachusetts, said Brian McNiff, spokesman for Secretary of State William F. Galvin, whose office oversees the state’s historical commission. “It’s important to the visitors and residents to preserve the streetscape,” Fiori said. Some communities have been placing more of their buildings within historic districts. That includes Edgartown, which expanded the size of its district last year; Brookline, which added an eighth district in 2015; Swampscott, which approved four districts in 2014; Framingham, which added two districts last year; and Amherst, which added a new district during Town Meeting last month. Newton issued 473 building permits citywide for new residences from January 2013 through May 2017, according to records posted by the inspectional services department. During the same period, it issued 485 building demolition permits. The campaign to preserve more houses in West Newton Hill began last fall after several older homes were knocked down in the neighborhood. The historic district would stretch roughly from Washington Street to Commonwealth Avenue, and from the corner of Temple and Berkeley streets to the intersection of Highland Street and Somerset Road. 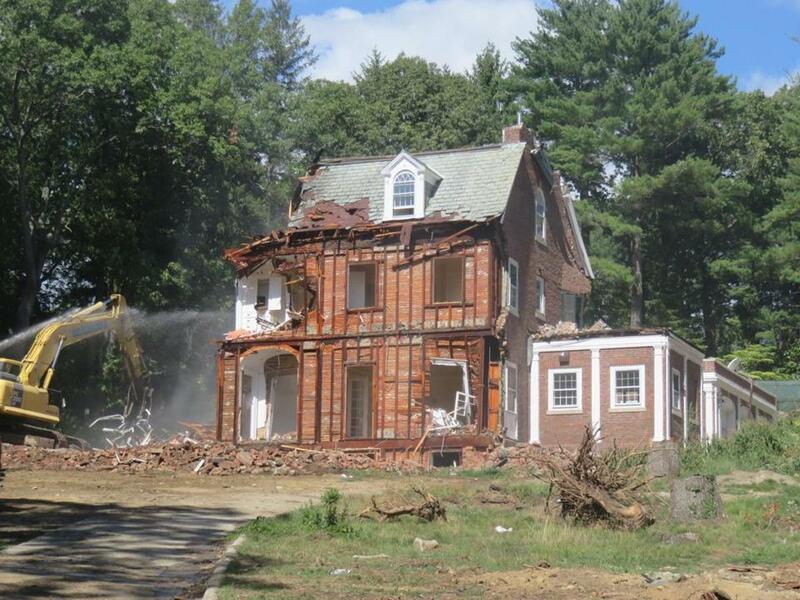 Even without a historic district in place, homes in Newton that are at least 50 years old would come under review if an owner or developer sought a demolition permit, said Katy Hax Holmes, the city’s senior planner. Newton’s demolition delay bylaw can block a home’s destruction for as long as 18 months, depending on its historical significance. There’s no question the bulk of the city’s housing is old — about 85 percent was built at least a half century ago, she said. That means some of the homes that can now trigger a historic review were built in the 1960s, including simple ranch and split level homes. Ironically, if those buildings are knocked down for new, multi-level homes, the city would lose out on the kind of housing it needs for a growing senior population. “As the population gets older, single-floor living becomes more desirable,” she said. At Monday’s hearing, opponents of a West Newton Hill historic district appeared to outnumber supporters when City Councilor Ted Hess-Mahan asked for a show of hands. Bob Fox told city councilors that the measure would only cost the city in staff time and resources, plus impose more regulations on residents. “By creating an additional level of scrutiny just to prevent teardowns, [that] is a blunt instrument.” he said. Pratima Abichandani said her house has been completely redone, and had the historic district been in place when she and her family were looking for a home, they would have moved on. “I would not have bought the house, just because it would add an extra layer of hassle in my life,” she said. Treffle Lafleche said that some homes have been cared for since the 19th century, and residents should be allowed to continue that tradition on their own. “Homeowners will protect the character of their neighborhood as they renovate their homes,” he said. No vote was taken at the hearing, and Hess-Mahan said no decision will be made until at least the fall. Meanwhile, city officials will survey the neighborhood’s more than 300 households to gauge support for the measure. Nancy Schon, who has lived in Newton since 1928 and backs the proposal, told councilors that West Newton Hill needs to preserve the appearance of its old buildings. “We must preserve this neighborhood, this legacy, to leave to the next generation,” she said.